Emma Fried-Cassorla of Philly Love Notes is donating anything she makes off of her map sales to local nonprofits until Tuesday. Not done your holiday shopping like the rest of us? Emma Fried-Cassorla, founder of Philly Love Notes, may have just made your decisions a lot easier. 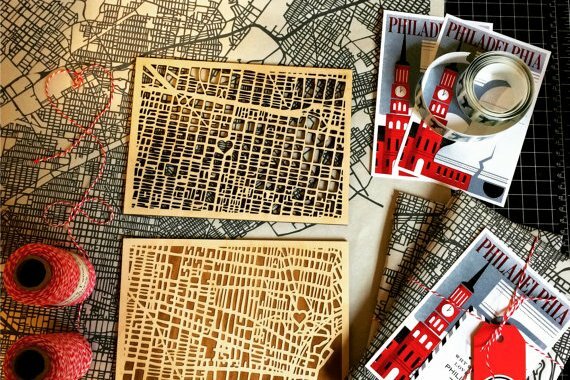 The Philly enthusiast, famous for her custom wooden and glass maps of the city and blog that collects love letters to Philadelphia, has decided to give up all profits from her sales to a handful of local nonprofits until Tuesday. "Now more than ever, I feel a need to give back to my community," Fried-Cassorla wrote in her Etsy store. So what are the nonprofits? Fried-Cassorla picked the People's Emergency Center, the Black Star Film Fest, the Fund for the School District of Philadelphia, Asian Arts Initiative, American Civil Liberties Union of Pennsylvania, Fairmount Park Conservancy and The Sunday Breakfast Mission. She's raised more than $1,500 in about 72 hours, with a mission to raise $3,500 by Tuesday night, she told Philadelphia magazine Saturday. Her maps run anywhere from $50 to $375. Interested in helping out? You can find her stuff here.